Sparkling Reed-Orchid is a small to just medium sized, warm to cold growing, drooping or drooping orchid found growing on mossy branches of old gnarled trees. It is so-named because of its rush-like leaves. It has a curved, round stem carrying many, linear-round, channeled leaves, unequally bi or tri-toothed at the tip. Flowers are borne in leaf-axils, in nearly erect to drooping, 12.5 cm long, paniculate, densely many flowered inflorescence with small, pointed floral bracts all carrying fragrant flowers. 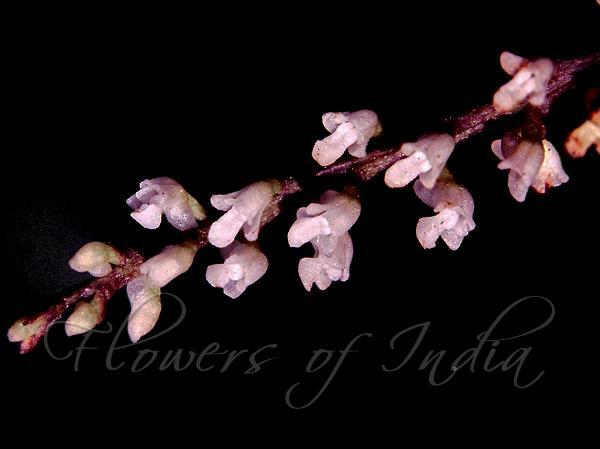 Flowers are 3-4 mm; sepals white or bright purple with white apices, petals bright purple, lip white with purple on spur and lateral lobes, column and anther cap yellowish brown; flower-stalk and ovary purplish red, about 3 mm. Dorsal sepal ovate, 1.5-2.2 × 1-1.2 mm, 1-veined, blunt; lateral sepals slightly obliquely ovate, 2-2.5 × 1.1-1.4 mm, dorsally slightly carinate, tip blunt. Petals obovate-wedge-shaped, 1.1-1.5 × about 1 mm, 1-veined, tip flat and notched; lip spoon-shaped, 3-lobed; lateral lobes erect, subovate, about 1.5 × 1 mm; mid-lobe obovate-spoon-shaped, 2-2.5 × 1.7-2.1 mm, thickly fleshy, shortly clawed at base, tip blunt; spur parallel to ovary, conic, about 2 × 1.5 mm, blunt. 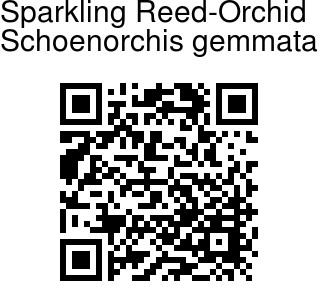 Sparkling Reed-Orchid is found in the Eastern Himalayas, from Nepal to NE India, Tibet, Thailand, Indo-China, at altitudes of 1400-1800 m. It is also found in Western Ghats. Identification credit: P.S. Sivaprasad Photographed in Topslip, Anamalai Tiger Reserve, Tamil Nadu.